Candida auris (C. auris)is an emerging pathogen that can be difficult to identify, spreads quickly, and is hard to treat. Nurses should be concerned with unusual patterns of Candidiasis within their facility. Infection control practices (including isolation precautions, cleaning and disinfection, and hand hygiene) can help control the spread of auris. PREVENTION and management of “superbugs” or “nightmare bacteria” require that nurses understand the complexity of the organisms involved and their impact on the care environment. They also require comprehensive patient education. Candida auris is a highly communicable, emerging global pathogen that requires special attention from all healthcare professionals. C. auris has caused international public health concern and prompted the Centers for Disease Control and Prevention (CDC) to issue a clinical alert in 2016. As of November 20, 2018, a total of 487 (457 confirmed, 30 probable) cases of C. auris had been confirmed in 12 states, with most in the New York City area, New Jersey, and the Chicago area. Candida, which includes about 20 different species, is a type of yeast that lives in the GI tract, mucus membranes, and skin without causing infection, making it part of our normal flora. Howver, overgrowth of Candida (candidiasis) results in some of the most common fungal infections in the world. Risk factors for candidiasis include diabetes, longterm antibiotic use, and a compromised immune system. Candidiasis has a high mortality when it becomes invasive. Treatment with five classes of antifungal medications (polyenes, azoles, nucleoside analogs, echinocandins, and allylamines) depend on infection site and severity. 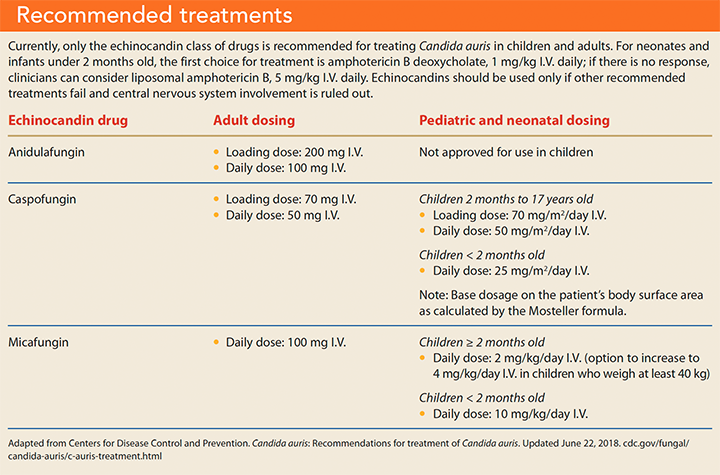 Currently, echinocandins are preferred for treating invasive candidiasis, candidemia, and esophageal candidiasis. Until recently, antifungal medications have been relatively successful at treating candidiasis. However, C. auris has proven not only challenging to identify with current laboratory tests, but also difficult to treat and control in healthcare settings. Since it was first isolated from ear drainage samples in 2009, C. auris has been found on five continents. It’s been isolated from different body sites and medical devices and cultured from surfaces in healthcare settings. C. auris affects all ages, but it’s most likely to infect patients who’ve had long hospitalizations, been admitted to intensive care units, resided in nursing homes, received indwelling medical devices, been administered prolonged antibiotic therapy or total parenteral nutrition, or had recent surgery. Patients with a weakened immune system or diabetes, and those who’ve received broad-spectrum antibiotics and antifungal agents, also are vulnerable. Every antimicrobial medication has a unique function it deploys to destroy the targeted pathogen. Some pathogens are naturally resistant to medications (intrinsic resistance). Others become resistant when they learn the strategy of the medication being used to combat them and build defenses. This last form of resistance development is of particular concern to public health officials and healthcare providers. Think of it as an opponent getting a sneak peek at your playbook. If an organism is intrinsically resistant, we can’t do anything, but if it develops resistance, we could have prevented that by providing proper treatment in the first place. Resistance is detected through susceptibility testing during the microbiological identification process. Distinguishing C. auris from other Candida species using matrix- assisted laser desorption/ionization time-of-flight (MALDI-TOF) devices is possible. These devices use protein fingerprints of organisms from a database to compare to the isolate being tested. Unfortunately, most MALDI-TOF reference databases don’t yet contain C. auris. In April 2018, a new testing method (Bruker MALDI Biotyper CA System) received U.S. Food and Drug Administration (FDA) approval to identify C. auris. Like MALDI-TOF, it compares ionized microorganisms from patient samples to a reference database. During validation studies, this new method reliably detected the organism 100% of the time. When C. auris is isolated from a culture, it’s sent to regional or state health department laboratories for further analysis. From these samples, researchers attempt to understand how C. auris develops resistance. Unlike other organisms, C. auris exhibits variable susceptibility profiles depending on the genetic makeup of the specific sample being tested. Further genetic testing of C. auris samples shows many modes of drug resistance acquisition. Making matters worse, C. auris genes facilitate its ability to adapt to changing environments, enhancing its pathogenicity. The many factors that cause C. auris drug resistance make predicting resistance difficult and limit the ability to identify drugs for treatment. The CDC reports that 90% of C. auris isolates in the United States are resistant to fluconazole, 30% show resistance to amphotericin B, and 5% are resistant to echinocandins. As more cases are identified and isolated, this resistance pattern could change, but for now it indicates that only one drug class (echinocandins) is a reliable treatment. The complexity of C. auris and difficulty treating it with current antifungal regimens requires enhanced infection control practices (including isolation precautions, cleaning and disinfection, and hand hygiene) to help prevent its spread. You should be concerned if you see unusual patterns of candidiasis within your facility, especially if it seems infections are spreading from one patient to another. Place patients who have suspected or confirmed C. auris infections or colonization in private rooms and use standard and contact precautions (wear at least a gown and gloves while in the patient’s environment). If you use a workstation on wheels (WOW) or portable electronic monitoring devices, consider dedicating these pieces of equipment to the patient’s room for the duration of hospitalization. Maintain contact precautions throughout the patient’s stay and minimize the number of staff who care for the patient, if possible. To prevent spreading the organism during patient care activities, perform frequent hand hygiene with an alcohol-based hand rub or soap and water. Remove invasive indwelling devices (such as urinary catheters, central venous catheters, and endotracheal tubes) as soon as possible to reduce the risk of invasive infections. Routinely used environmental disinfectants may not effectively kill C. auris. The CDC recommends cleaning the rooms of patients with C. auris daily with an Environmental Protection Agency–registered, hospital-grade disinfectant that’s effective against Clostridioides (formerly Clostridium) difficile. Concentrate on horizontal surfaces and high-touch areas, such as bed rails, bedside tables, door knobs, and call lights. Wipe down patient care equipment after each use, including stethoscopes, portable electronic monitoring devices, and WOWs. To ensure adequate contact time, follow the instructions for use of your facility’s disinfectant. If privacy curtains are present, have them removed and replaced or laundered before admitting another patient to the room. Candida auris isn’t limited to the hospital setting. The Centers for Disease Control and Prevention provide considerations for long-term care (LTC) and home health settings. When developing the care plan, consider comorbid conditions, such as frailty and dementia. Place LTC residents with C. auris on standard and contact precautions. Functional residents who don’t have wounds or indwelling medical devices (I.V. lines, urinary catheters) and who can perform hand hygiene might be at lower risk of transmitting C. auris. Facilities can consider relaxing the contact precautions for these residents, but healthcare personnel should still use gowns and gloves when performing patient care tasks (such as changing wound dressings and helping with toileting) that put them at higher risk of contaminating their hands or clothing. Residents with C. auris can leave their rooms as long as secretions and bodily fluids can be contained and the patient can perform hand hygiene. If a resident with C. auris receives physical therapy or other shared services, staff should not work with other patients while working with the affected patient. Staff should use gowns and gloves when they anticipate touching the patient or potentially contaminated equipment, and ideally, the affected patient should be the last to receive therapy that day. Shared equipment should be thoroughly cleaned and disinfected after use with a bleach-based cleaner. Use standard precautions with strict adherence to hand hygiene. Wear a mask and eye protection or face shield if performing procedures likely to generate splash or splatter (for example, suctioning) of contaminated material (blood, body fluids, secretions, excretions). Perform hand hygiene using alcohol-based hand sanitizer or soap (plain or antibacterial) and water. Wear disposable gowns and gloves when entering the area of the house where patient care will be provided. When leaving the patient care area, remove gowns and gloves, dispose of them properly, and perform hand hygiene. Use a bleach-based cleaner to properly clean and disinfect any reusable equipment before use with another patient. If the patient needs to be admitted or referred to another facility, inform the receiving facility of the patient’s C. auris status. The CDC encourages reporting suspected cases of C. auris to your local public health authority, which can provide valuable resources. The Antibiotic Resistance Lab Network, for example, performs laboratory testing for pathogens of concern, susceptibility testing and resistance patterns, and whole genome sequencing. As more analysis of C. auris samples are received and reviewed, state and national public health authorities can begin linking cases to identify commonalities and recognize opportunities to minimize future risk. Reducing the spread of pathogens in patient care areas requires diligent adherence to standard infection prevention interventions. However, routine measures may not be enough to contain C. auris, and without reliable diagnostic tests, its transmission may go undetected. Deploying enhanced intervention—such as dedicated equipment and limited staff—is the best way to avoid further spread of this highly pathogenic organism. 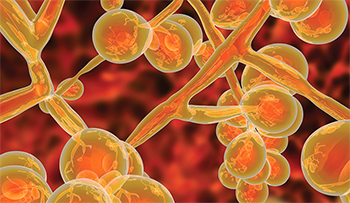 Report increased cases of Candida infections in your facility and work with leaders from infection prevention and microbiology to help reduce transmission and enhance patient safety. The authors work at Methodist Health System. Marie H. Wilson is an infection preventionist in Dallas, Texas. Cheryl Hammer is the manager of infection prevention and control in Mansfield, Texas. Chowdhary A, Sharma C, Meis JF. Candida auris: A rapidly emerging cause of hospital acquired multidrug-resistant fungal infections globally. PLoS Pathog. 2017;13(5):e1006290. Dolande M, Garcia N, Capote AM, Panizo MM, Ferrara G, Alarcón V. Candida auris: Antifungal multi-resistant emerging yeast. Curr Fungal Infect Rep. 2017;11(4):197-202. Jeffery-Smith A, Taori SK, Schelenz S, et al. 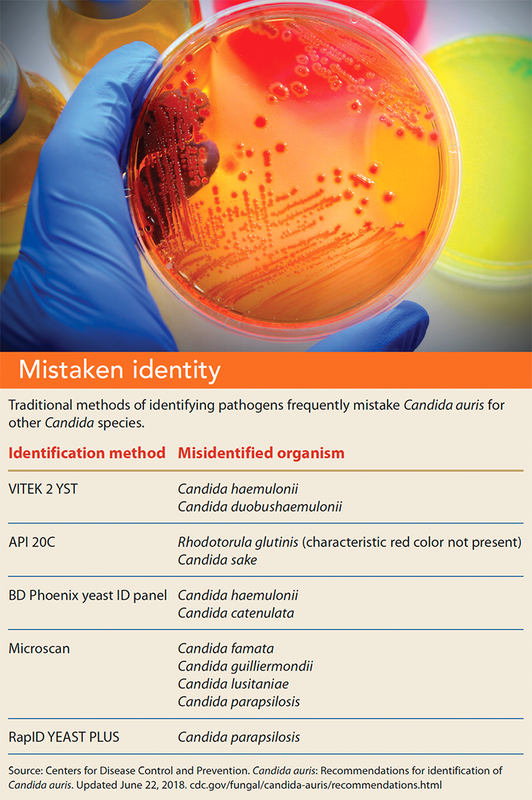 Candida auris: A review of the literature. Clin Microbiol Rev. 2017;31(1):e00029-17. Pappas PG, Kauffman CA, Andes DR, et al. Clinical practice guideline for the management of candidiasis: 2016 update by the Infectious Diseases Society of America. Clin Infect Dis. 2016;62(4):e1-50. Sears D, Schwartz BS. Candida auris: an emerging multidrug-resistant pathogen. Int J Infect Dis. 2017;63:95-8. Sharma C, Kumar N, Pandey R, Meis JF, Chowdhary A. Whole genome sequencing of emerging multidrug resistant Candida auris isolates in India demonstrates low genetic variation. New Microbes New Infect. 2016;13:77-82. Voelker R. New test identifies Candida auris. JAMA. 2018;319(21): 2164. Welsh RM, Bentz ML, Shams A, et al. Survival, persistence, and isolation of the emerging multidrug-resistant pathogenic yeast Candida auris on a plastic health care surface. J Clin Microbiol. 2017;55(10):2996-3005.